Are you sick and tired of your nail polish chipping within a few days (if you’re lucky)? At this heart, gel polish will give your nails a strong and glossy finish that can last for weeks. Before the only way that you could get perfect gel nails was to visit a salon. Now home gel nail kits are becoming more popular by the day. Even celebrities are using them to get red-carpet-ready in a dash. This beauty secret will leave your nails with a long-lasting shine, and you’ll have so much fun in the process! Gel nail polish is different from ordinary nail polish because it’s set under a UV lamp. This isn’t just about drying the gel faster. The UV light will set it so that it will stay flawless on your nails for around 1-2 weeks. You may think it will be a nightmare to take off again, but gel is removed by a gentle 10-15 minute soak. Follow up with cuticle oil and moisturiser, and your nails will be healthier than ever. Gel nail kits come with easy step-by-step instructions so you don’t have to be a total pro to apply them. Ladies, you need to go with the best possible products. Cheap gel kits just won’t do you any favors. Could this be the perfect gel manicure starter kit? I think so. I first heard about this set from another professional nail technician. I was looking for an easy-to-use gel kit that will make my nails look like a million dollars. This kit fits the bill. 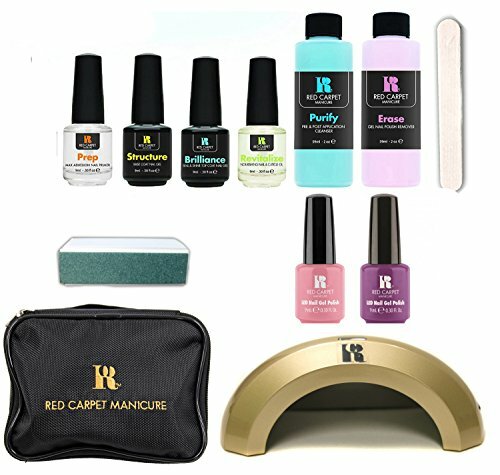 It comes with EVERYTHING you need to do your gel manicure from an LED light that cures the nails in less than 45 seconds (tested), primer, base coat, top coat, nourishing cuticle oil, cleanser, eraser, beautiful polishes, a shining block and a nail file. Oh and a travel bag, how could I forget! 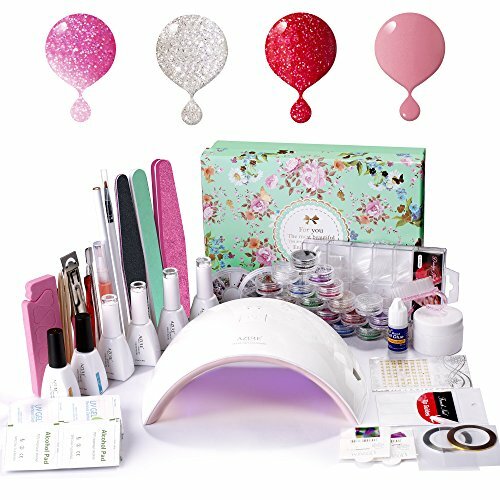 With so many goodies, this gel kit looks like it should cost hundreds of bucks when it rings in at less than $60 on Amazon. My nails look like they’re fresh out of a salon for more than 2-weeks. I can’t fault it. Azure Beauty make some of the most highly sought after nail gel kits around. Now they’ve extended their range into simplified sets that you can enjoy in the comfort of your own home. When the package arrives, it’s so pretty that I feel like I’m indulging myself. All of the products used by Azure Beauty are made with 100% natural resin, which will make the gel glide on with ease and last a long, long time. Anyone can use these products, even people with brittle nails. It’s a sure-fire hit, every time. Looking for the ultimate, compact, gel nail kit that you can actually travel with? You’ll love this set from Modelones. The lovely pastel colors are great all seasons from summer to winter. 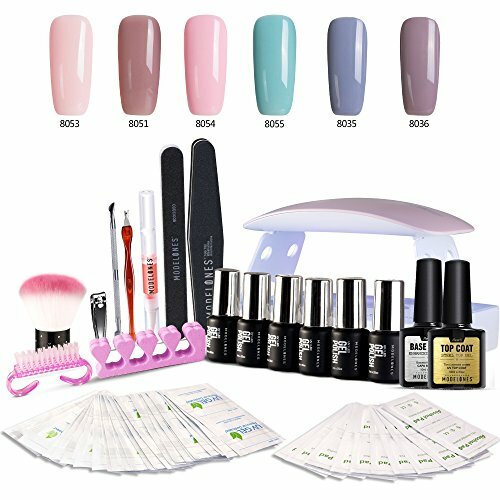 The pack comes with a UV nail lamp, 6 x color gels, a base coat, a top coat and a manicure kit with an amazing 12-pieces. It sounds like a lot of small parts, but this is all you’ll need to get started and trust me, you’ll have so much fun! The gel itself is high quality and my nails never chipped in 12-days. If like me you go through gels quickly, you’ll be ordering this again, and again.